Small groups are gatherings that meet regularly—usually 2x per month– and provide an opportunity to build relationships, discuss biblical truths, and support one another. These are our discipleship focused communities. Leaders help others to grow closer to God, grow closer to others, and grow to become more like Christ. They do this by studying bible-based curriculum, outreach, prayer, and fellowship. This is a NEW type of group at Zion! The focus of these groups is a “shared interest” like discussing politics, being a single-parent, or riding motorcycles. You choose the topic and we help you find others at Zion that are interested in that topic. 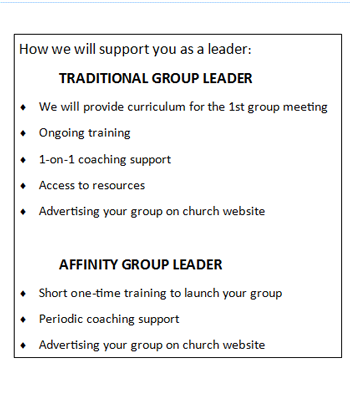 Affinity groups use shared interests to build relationships and create environments that help people grow spiritually. Spiritual growth can happen while praying for one another, serving together, or caring for group members.